Job health and safety may seem like a bunch of rules and regulations, or even one more responsibility in a long list for the pressure washing business owner. In reality, keeping vigilant about health and safety issues can keep you and your staff healthy and keep your business growing and even prospering. 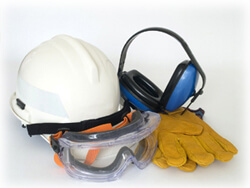 Let’s take a look at some of the most common health and safety risks and how to minimize them. Roof work is arguably one of the hottest jobs around. Temperatures on a roof top in the midday sun in the summer are extreme and workers may tire easily or even suffer from heat exhaustion or heat stroke. Restricting work on roofs to early morning or late afternoon can reduce the health and safety risk of illness and most likely improve the mood of employees! The second and more dangerous risk of roof work is falling. Anti-fall devices such as safety belts, lanyards or lifelines will help prevent falls. In the case of an extremely steeply inclined roof, toe boards will provide additional protection. It is very important to cover any skylights or other roof openings that could result in a fall into the interior of the building. You may not immediately think of carbon monoxide as a health and safety risk in your pressure washing business, but the use of combustion engines in pressure washers as well as the exposure, you and your workers face on the job site make CO pressure washer health and safety priority. Proper maintenance of your equipment should ensure that no excessive CO is being emitted, so long as the unit is used in a well ventilated area. If the pressure washing is being done in an enclosed space, be sure to provide respirators. The same advice would serve you well when working in a particularly congested area, such as a city parking garage or other enclosed space. Carbon monoxide poisoning can occur very quickly and can be deadly so it is better to err on the side of caution. Our world is a noisy place and we have often come to take it for granted, but prolonged exposure to high decibel noise will have a damaging long term effect on hearing. Yet another reason to keep all equipment in good working order is to keep the unit working at a sensible noise level. At normal levels, it is most likely not necessary to wear ear protection, but when you add in the ambient noise, it may be advisable for your health and safety. While we all have heard that it is bad luck to walk under a ladder, you may not know that using a ladder can be dangerous! Ladders should be used with great care and according to the manufacturer’s instructions. Regular inspection and cleaning of ladders can prevent accidental falls and even death. Obviously, your pressure washing operation will be dealing with water under great pressure, and it may seem overly cautious to worry about water pressure, but it is important. Wearing personal protective equipment all year round reduces the health and safety risk of injury that can be caused by the powerful water pressure. While most contractors use gas powered pressure washers, some rely on electrical models even in this constantly wet environment. The risk of electric shock is ever present and you should take care to inspect all machines and wiring to reduce the health and safety risk to you and your workers. When using chemicals in a pressure washing environment, it is imperative to have as much information about their use, healthy and safety risks, dangers and disposal recommendations as possible. The National Institute for Occupational Safety and Health provides contractors with a guide to hazardous chemicals that should be in the tool bag of any contractor who is dealing with chemicals. The bottom line is keeping an eye on your equipment, your surroundings and your workers to be healthy, safety and stay in business.